Microbial processes in the degradation of fibres; Bast fibres (flax, hemp, jute, ramie, kenaf, abaca); Alginate fibres; Cellulosic fibres and fabric processing; Lyocell fibres; Polylactic acid fibres; Poly(hydroxyalkanoates) and poly(caprolactane); The route to synthetic silks; Biodegradable natural fibre composites; Biodegradable nonwovens; Natural geotextiles; Conversion of cellulose, chitin and chitosan to filaments with simple salt solutions; Soya bean protein fibres – past, present and future. With increasing concerns regarding the effect the textile industry is having on the environment, more and more textile researchers, producers and manufacturers are looking to biodegradable and sustainable fibres as an effective way of reducing the impact textiles have on the environment. The emphasis in Biodegradable and sustainable fibres is on textiles that are beneficial by their biodegradation and come from sustainable sources. Biodegradable and sustainable fibres opens with a discussion of microbial processes in fibre degradation. It then moves on to discuss the major fibre types, including bast fibres, alginates, cellulose and speciality biodegradable fibres, such as lyocell, poly(lactic acid) and poly(hydroxyalkanoate)s. The development of synthetic silks is covered along with biodegradable natural fibre composites, nonwovens, and geotextiles. The final chapter looks at the history and future of soya bean protein fibres. 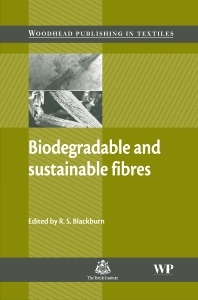 Biodegradable and sustainable fibres is a comprehensive monograph providing essential reference for anyone interested in the area and environmental issues relating to textiles including fibre and textile scientists and students, textile technologists, manufacturers, and forensic specialists in industry and academia. Dr Richard S. Blackburn is a Senior Lecturer in the School of Design at the University of Leeds, UK. Dr Blackburn is well-known for his research in the areas of green chemistry and sustainability. He is also a co-founder of Dyecat Ltd and the RITE (Reducing the Impact of Textiles on the Environment) Group.